Question Time LiveBlog 11th August 2011: Crime Special! David Cameron may have recalled Parliament today to discuss the looting and criminality, but we all know who really think they run the country. Yes, the BBC have recalled Question Time. As usual the media are exaggerating the disturbances. What the BBC called looting in Liverpool, we all knew as Wednesday but most importantly for Police Force Service quotas we have heard no reports of smoking ban violations or inner-city foxhunting. On the panel tonight we have an utterly unbelievable lineup of John “thug and adulterer” Prescott, LibDem Brian “my boyfriend didn’t deal in pot” Paddick, an exotically be-hatted Iranian called Camila Batmanghelidjh, also exotically be-hatted but in a different way Rev John Sentamu and Fraser Nelson. UPDATE: and David Davis – Cameron’s opponent for the leadership and a critic of his prisons policy. As a frequent critic of the government Fraser Nelson fits the BBC panelist profile of token rightist nutter so why isn’t there a representative of the government? At all? Society has fallen apart after 13 years of socialist education and social policy but you’d at least expect BBC pet wet rag Ken Clarke on their speed dial to make a mess of the case for the defence. TheEye will be joined by the splendid David Mosque in moderating what promises to be a partisan carve-up unparalleled in the West since the Treaty of Versailles. TheEye intended to put together Shot Bingo for this event. “Deprived”, “Cuts”, “Fatcha” and so on. Maybe even doubles for Miners Strike. But the targets are too obvious and there’s an ‘elf’n’safety lawyer risk to how much liver damage would be caused. Tequila, my friends, is the way forward. But limit yourself to a bottle. TheEye, to keep a sense of refinement, may open some calvados. Join us at 10:30pm at your peril. 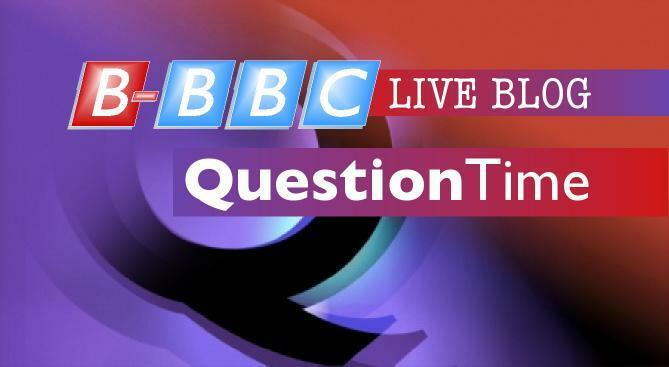 38 Responses to Question Time LiveBlog 11th August 2011: Crime Special! I was shocked too. Even the impartiality rules about equal time for Boris as a candidate have been abandoned over the past week for the BBC adoration of the Newt Lover. Wow. Followed the wiki link, they weren’t kidding when they called Ms.Batmanghelidjh ‘colorful’. And your posters were NOT kidding about her name. She looks like a badly wrapped present. One you’d rather not open. I was wondering which of the Dimblebys would grace us with a drop by from Tuscany as a screaming nation cried for the return of a Question Time! Yes-the Question Time clapperboards, cummerbunds and bussed-in bolshies are-as we speak-being towed along the Thames by velveteen Shire Horses, and Dimbleby Major does his Vera Lynn aria scales with a cheeky little red(Yvette Cooper?) on a velvet cushion to perk him up! Riots over-tell our Salford scamps to stay home and watch the curfew enforced by a withering stare on newly-acquired HD plasma screens! Think Dimbleby Minor is out and about checking Croydon for those licenses they may have inadvertedly overlooked in the excitement! Bless `em all-and thanks to you all for watching! I have a white dog turd to research…how much bloody chalk did he have to eat to get to bake one like that…I assure you that you`ll be jealous of me by the time the credits roll! It’s kind of a no-win, but the Gov really has to manage such stuff better. At least we were spared the utter wets or egotistical brain donors that usually get seduced on to dig deeper holes. However, it cannot be right that a small cabal of BBC back-room bods ‘manage’ such things on what they will ‘accept’. They invite, and drop on whim all the time. If the BBC ‘refused to accept’ a government spokesperson as it didn’t suit their framing vision, then that is beyond the pale. There is no longer any excuse for the BBC. Is anyone else getting a Trojan script (Iframer) warning from this Cover-It Live thing? Or does it have to do with whatever else is bugged on the site recently? I’m not seeing anything odd…you’ve got my email David – send me a screenshot and I’ll take a look. Well thats the panel – can we expect the audience will be full of welfare dependent youth all with a greivance against government cuts. Actually when you look at the panel it epitomizes why we are in the state we are in. A hypocrite socialist (in the House of Lords!!) who since he failed his 11 plus has had a massive chip on his shoulder. Then a homosexual ex- policeman. An Iranian. An immigrant churchman and an editor of a newspaper. These people do not represent the people. They have no more right to tell us how to live then the unelected black youth looting in London. What they represent is a tiny minority determined to present their minority prejudice as mainstream. The BBC has been a major facilitator of this fraud on the British people. I could rightly guess that the panel and the rigged audience rightly account for 10% of the greate populations positions and moral outlook. It is the tyranny of the vocal minority, a rigged panel in front of a rigged audience broadcast by a rigged BBC. Sad and pathetic? Certainly is. But what is sadder is that they cannot see that we see through their sad childish charade. i keep getting this virus warning whenever I access this site, any ideas? It is detected and then denied by Kaspersky. Just had the same a few minutes ago from Kaspersky. But will read on regardless, well – I hope so ! Same here, also using Kaspersky. It’s the Cover-It Live embed, but I don’t know what the actual cause is. The comments have been bugged for a couple days, so maybe it’s related. The Echo comments were their issue and have worked themselves out from what I can see…and would be unrelated to any embed problem like this. In the same way that an error with a YouTube or EyeTube embed would almost always be unrelated to an Echo or a Blogger problem. We pull together four or five different techs here and they play nicely with each other. If one goes off the reservation then the others usually stay solid. But I’ve logged the alert with CoverItLive and I’ve got to say that they’ve been splendid in the past with accurate and useful answers so all is under control. Anyone watching “The One Show” bloody item on how bad water cannon are!! Hopefully all those stolen TVs have been set up by now so the relevant segment of The One Show audience can watch. The ‘why’ show morelike, it really is the pits. I guess we won’t know for sure what Kaspersky is allowing until the live chat launches this evening. I have a friend who hasn’t used an AV program for years, he says there’s no need. Just make sure you have an email scanner, avoid IM programs and be sure to hover or check up on any links you might want to click on. He hasn’t had a virus/trojan/bug in all that time. He probably has, but is unaware! Crime special: just had a quick view of Parliament. Blears complaining about people running off with illegal TV’s. Well she should know all about that. He’s bound to. Almost certain. That’s a nailed on Bingo-Drink. There’s more entertainment to be had for us running a “<1m”, “1-5min”, “5-10min” sort of sweepstake on the phrase. It will be interesting to see how far Labour push the ‘it’s the cuts to blame’ line tonight. Ed Milibland has resisted so far, but will others be able to. If they have an audience of real people, they won’t be in the mood for excuses or false justifications. What’s the likelihood of a representative audience on QT? Bloody Harriet on ITV now on a Tonight Show special. She’s everywhere at the moment. They’re giving plenty of voice to the victims of the violence and looting. Shop owners and residents. There’s a lot of anger and no sympathy. Some might say I have the ideal name to comment on this issue. I’ve seen two well-informed debates on the riots, last night on channel 4 and just now on Sky with Peter Hitchens contributing. The BBC have so far given us a “debate” between those two intellectual collossi of our times, Baroness Warsi and Diane Abbot. I’m not holding out much hope for QT, although I do like Sentamu. Yes – Sentamu doesn’t appear to hate everything about this country. Unlike the bearded marxist in a dress. By that I mean Rowan W. – not Harriet H.
ArchB Sentamu may have made a couple more intelligent and valuable speeches in the past about personal responsibility and whatnot than the ArchBeard has, but in the House of Lords today (or was it yesterday? not sure) he said that it was too early to tell what was behind the riots and we “should not rush to judgment” etc., let’s have a dialogue, blah, blah. So not much hope there for tonight. Hitchens-Phillips-the very nemesis of all that the Beeb and the left wing cringers stand for! Therefore exactly the hate figures of anything on the BBC-Lord alone knows why they bother! Prophets without honour on their own media…but thank God for the two of them and the few good `uns like Hannan, Murray that have yet to bow the knee to Auntie! Just noticed something as soon as somebody attacked Prescott and the last 13 years of labour rule there was somebody in the front row ready with the anti Tory jibe. A ringer? It’s been going on a while… they do try hard to stay on ‘editorial nessage’ and by whatever means they can. Break up the BBC I say. A “rapid rebuttal unit” in action. Of course, Dimblebot didn’t intervene. Came to the blog this morning in the expectation that the assorted blowhards and secretary screw merchants might have got our ganders up! Yet all is calm-clearly there was nothing to see-let alone learn! If any of us expected anything from a Prescott or CatmanBelly that we could not have written in chalk on the back of a cereal box in advance, then we`d not had a bellyful already of beeb slurry on a fine nozzle. still at least we know with John and Camila in the same green room, that perpetual elephant in the room at the BBC is in no danger of going through the floor. Presume Salford knew this already!